Stunning coastal and rainforest views, creeks, beaches, history plus stops and explanation of this fascinating region up the Bloomfield Track to Cooktown. 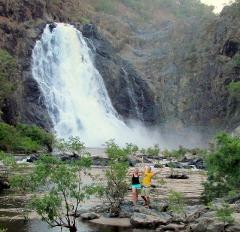 Includes most features of half day tour to Wujal (Bloomfield) Falls and more. A classic scenic 4WD tour through beautiful creeks, stunning mountain views, mangroves, strangler figs, fascinating Cowie Beach, along the Bloomfield Track. Photography, wildlife, and scenery. Includes the Wujal Wujal (Bloomfield) Falls. Wujal Wujal morning and afternoon trips cover the same territory up the Bloomfield Track. This early start tour gives an option for those on a short time table or wanting a free afternoon for other activities.